The Continental flag (used by the native peoples to represent Latin America (Awyayala, in Quechua): plain white. 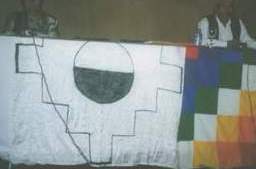 In Kara Chukiwanka’s article [qch9X] this flag pair is presented as «Janq’u Wip’ala», or white flag, one of the three flags of the Wiñaymarka culture. This is a flag pair, consisting of a square white flag and another flag. No explicit reference to the flag pair duality, apart from the illustration showing both flags (plain and two-triangle). No indication about its (modern?) use as the flag of Awya Yala (=South America). The continental flag also is has a pair. It is white (?) with a zig-zag cross with a central disc of two-colors (I only have a black and white image). This symbol is named chakana and the disc represents the day and the night. Flag with a white chakana (outlined in black) on white background, which makes a poor design. In this online 2005 photo (context), is also shown, but painted/pasted on a ribbon banner instead of held as a regular flag, the white square flag with large red chakana pierced with a black and white disc. 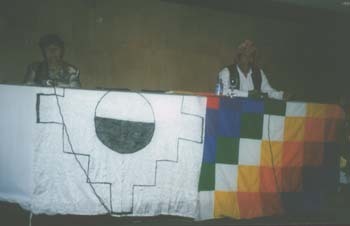 This flag can be seen in use, along with a Qullasuyu flag (white diagonal), as a lecture table cloth in a photo on line (context). 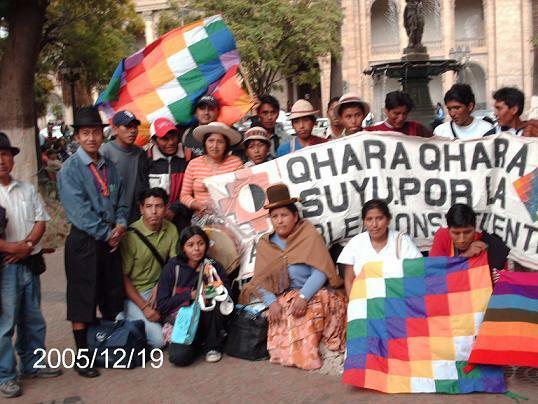 Note that on this photo the hoist of the flags used for table draping is facing down: The pattern for the chakana and its placement on the flag is based on the 7×7 square suyu flag design, which is yet another way to draw and place the chakana. In Kara Chukiwanka’s article [qch9X] this flag pair is presented as «Janq’u Wip’ala», or white flag, one of the three flags of the Wiñaymarka culture. This is a flag pair, consisting of a square white flag and a square white flag with two small triangles, yellow and red, joint in a figure of eight. According to Kara Chukiwanka’s article article [qch9X], this «signo bitriángulo de color amarillo y rojo »(…)« en base a las cuatro divisiones del Pusisuyu».